I should point out that this project would not have been possible without the [design] effort of many others. I just bolted it all together, but in my own particular way. It can handle an output SWR of 65:1 and an open circuit, just check out this video! 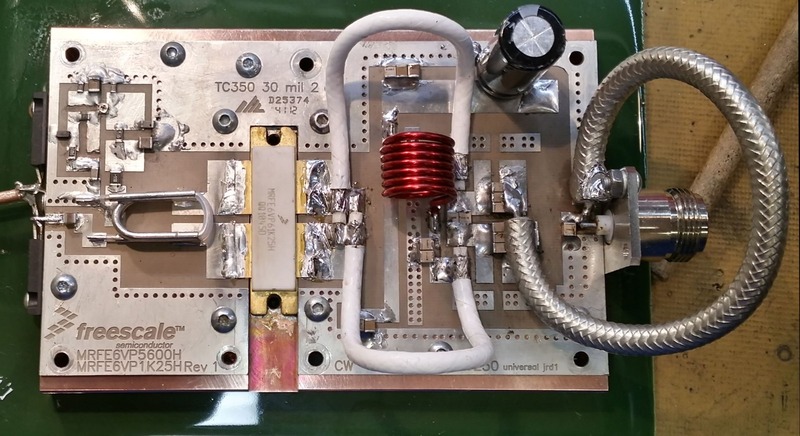 Before building the SSPA amp I had recently finished building another high powered 144MHz amplifier based on a pair of Harris Amplifier RF pallets and could produce around 750w. However after I finished construction it stopped working. This turned out not to be a failure of any PA devices, but instead a mechanical failure of the link between one RF pallet’s output and the combiner board which I think happened when I loosened some bolts on the heat sink while I was upgrading the cooling fans. When I built the Harris amplifier I had a metal screening plate over the PA and RF combiner boards and so the cause of the reduced RF output wasn’t noticed until this screen was removed, which required a lot of dismantling, effectively to its component parts, at this point I decided to rebuild it using an SSPA. 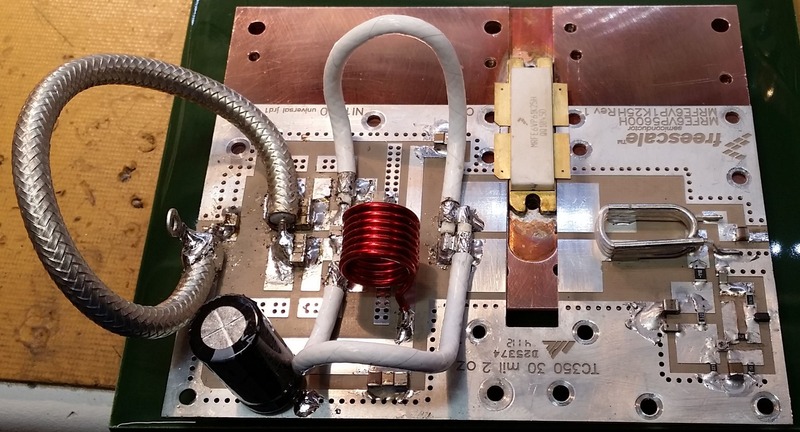 Although the amplifier was in effect a rebuild of the Harris amplifier, it still took hours (weeks) of effort to build. 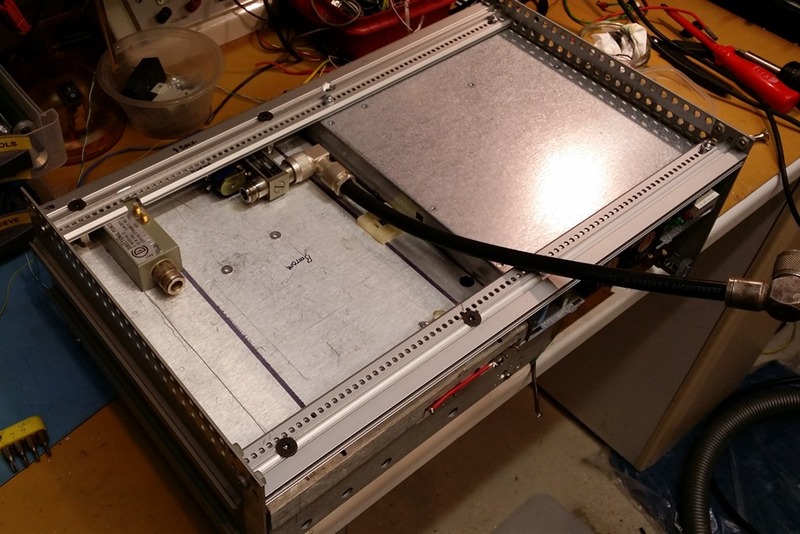 This was mainly down to the fact that it was a high power amplifier, not only in terms of RF power but DC power, I needed to make sure everything was right first time round by testing each stage and refining it, failures can be extensive and costly. In addition I also pushed myself with some of the metalwork, this is all about learning after all. Lets start with the metalwork, an area I’m weak in and were I challenged myself by wanting large holes close together and lots of them. The front panel alone called for quite a few holes, 3 of them being large and close to each other. Lesson 1: use tools and equipment which are quality have decent tolerances, if you don’t then the final result will be rubbish! just like my first attempt on the front panel. There isn’t a round hole in sight here, the gap between the 2 large holes on the right meant the aluminium plate broke, as it also did at the bottom of the middle large hole and the mounting hole to the bottom right of it. Sent an email to the local radio email reflector for advice. I’ve had a decent Bosch drill for a while but the drill stand I originally bought with it was cheap and was a little flimsy, meaning it was not great for accurate work, the new drill stand was a little expensive but the difference is telling, the top plate in the image below was made after getting the new drill stand, with comparison to the original one beneath it. In addition to the big holes I fitted a bunch of LEDs along the front so I could see the status of the amp, a rotary switch for the meter and a mains power switch. I put some pillars on the back of the meters M3 mountings which I then mounted a PCB on for all the wiring, in effect a junction/interface between the control board in the amp and the front panel. While it might take a little longer one tip I must give is to make projects like “modular” with connectors between then which allow you to disconnect things like front panels when assembling or debugging. It wasn’t just the front panel which required lots of drilling, the rear panel needed a couple of N-Type connectors and exhaust holes for the PA heat sink and the integrated 48v PSU has 2x 40mm fans at the front which blows air through the PSU and needs exhaust holes on the rear panel. This is the grid of round holes on the bottom left. It starts with marking out the grid in 10mm squares, then munching every second one, which is the pattern to drill. I first drilled 3mm pilot holes then slowly enlarged them to 10mm. An update I done vs. the Harris amp was how the main connector was mounted. In the original Harris amplifier it was mounted on the back panel meaning whenever i wanted to remove the back panel I had to disconnect the wiring from the connector which was quite tedious, and potentially quite dangerous with it being 240v wiring which needs to be defect free. This time round I mounted the mains connector to the back of the 48v PSU chassis, which was integrated into the main chassis, on standoffs so it stood far enough back to be inline with the rear panel which had a cut-out in it to match, this was also something originally out my comfort zone as in cutting the hole it’s sort of done blind but it did mean the mains connector was fixed to the main internals and the rear panel could be removed without issues with wiring. Additionally on the back panel were another pair of 80mm holes for the PA heat sink airflow, the 2x 16mm holes for the N-Types (RF in/out), the phone PTT input and the various mounting holes (coax relay, power detector) which were all countersunk for nothing other than neatness. As mentioned at the top this project is only me assembling, the PCB and parts was obtained from RFParts who sell all you need. I only purchased the PCB, most of the components but no heat sink or PA device. I already had a heat sink and bought a PA device from another contact at a cheaper price. 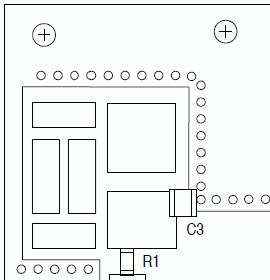 However some components are not supplied but are listed in the schematic. So I purchased them from RS Components. These parts individually come to £2.07 but some you have to order in quantities of 5 or 10 so it will cost a little more but you’ll end up with spares. Note the modified BIAS is in the top left. This is based on the changes published by W6PQL on his 144MHz SSPA Page which gives more control of the idle current, ultimately meaning you can reduce the current when in key down, therefore less heat is produced, remember the cooler you can make the amp run, the longer the Mean Time To Failure (MTTF) becomes so this is worth doing, see the ‘BIAS Enhancement’ section below. Here are a few points learnt when investigating the assembly of the PA board, I mention them here for others to take note of. Firstly, ensure that you mount C7,8,9 and C10,11,12 on their sides bunched up together so there are no gaps, this ensures that that RF does not flow through unevenly through them. Some builders have reported these capacitors ailing and in all instances I’ve seen the capacitors were mounted normally and with gaps. If you think about the RF and voltage levels, any gap between components could result in a difference in levels to develop. 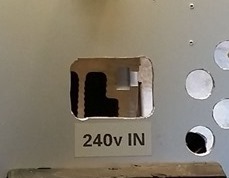 The image shows C7 to C12, not the other capacitors have their markings shown whereas due to being mounted sideways, the markings are not visible on C7 to C12 as they are on the side in relation to how the photo is taken. 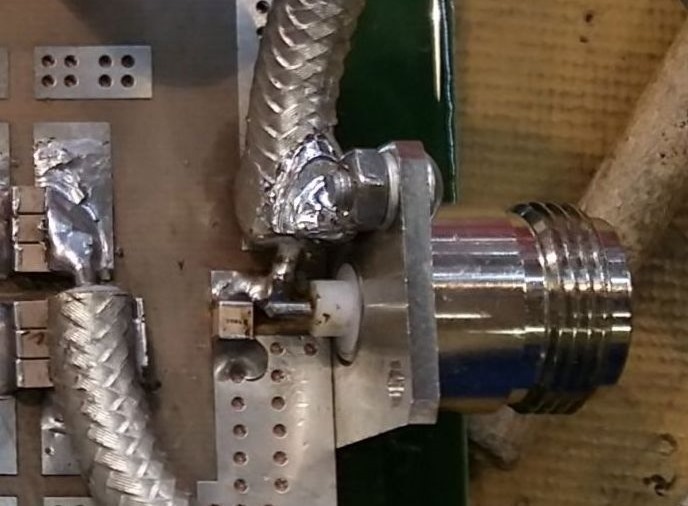 Secondly, when installing Coax 3, the length of coax used on the output side of the PA, it is very important, due to mechanical stresses, that the braid is not soldered directly to the capacitors (C10, C11 & C12) but instead the braid is soldered directly to the PCB pad. 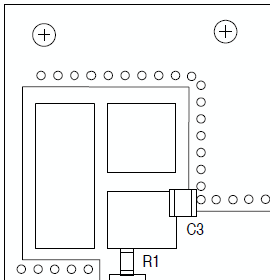 This could be done by building up enough solder to bridge the gap, or, as I have done (but is not clear in the image above), use a small piece of copper plate to bridge the gap between the braid and the opposite edge of the PCB pad to the capacitors. 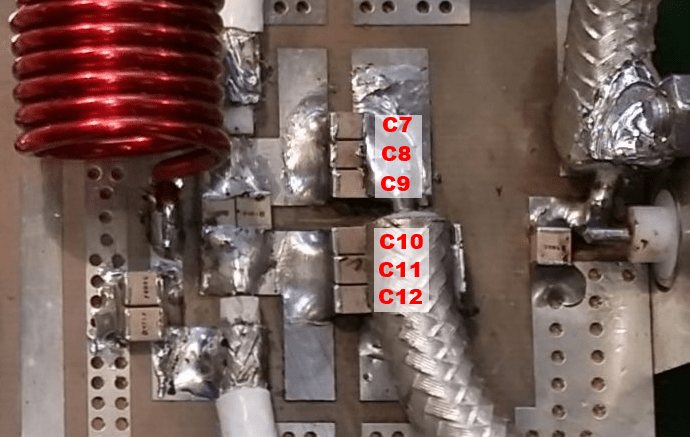 If the coax braid was soldered to the capacitors then it would likely lead to them fail due to cracking. Any mechanical stresses or shock on coax 3 (bending to fit into a box for example) will transfer down the coax to the capacitors, which are not designed to be mechanically stressed and are expensive. 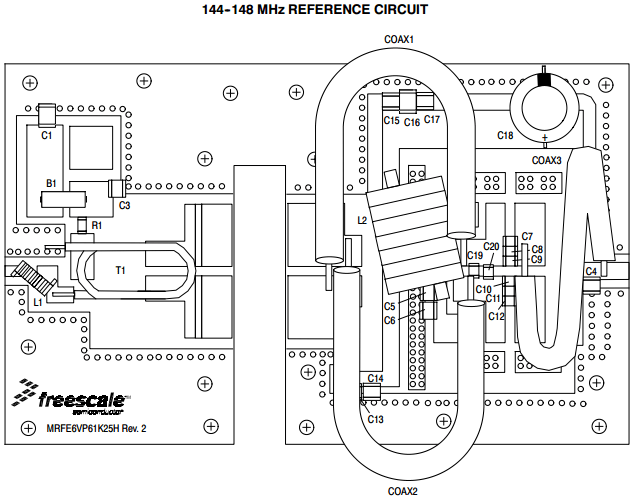 The Freescale reference PCB is supplied with a very basic bias circuit, this means the bias current, IDQ, might not be correct after assembly. To ensure IDQ can be set to required value the input bias circuit can be enhanced. The bias enhancement requires a only a few components, the schematic is below. 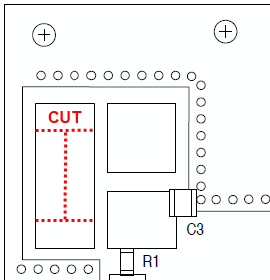 With 3 cuts to the PCB, these additional bias components can be accommodated on the PCB. The images below show the original PCB layout (left), where to cut the PCB (the middle image) and the required PCB layout (right image). I cut my PCB with a Dremel but a knife could also be used. Here is how it should look in reality with the components mounted. 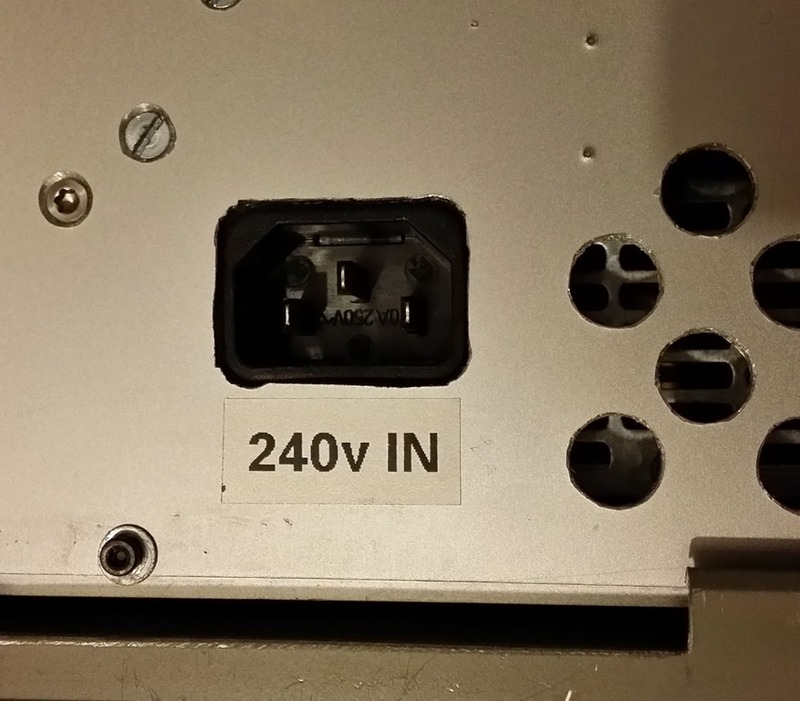 It is also worth mentioning that the IDQ can vary from 2.8 amps at 25°C to 7 amps at 60°C. So without temperature compensation, setting the IDQ at one temperature will mean a different IDQ when the PA heats up or cools down for the temperature the IDQ was set at. 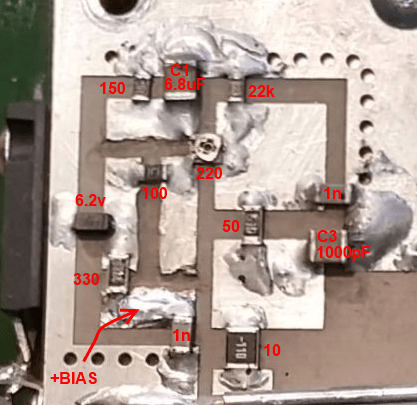 W6PQL states on his website that he “…replaced the 22k resistor in the bias circuit with a 5k, and added a 5k thermistor in parallel with that. 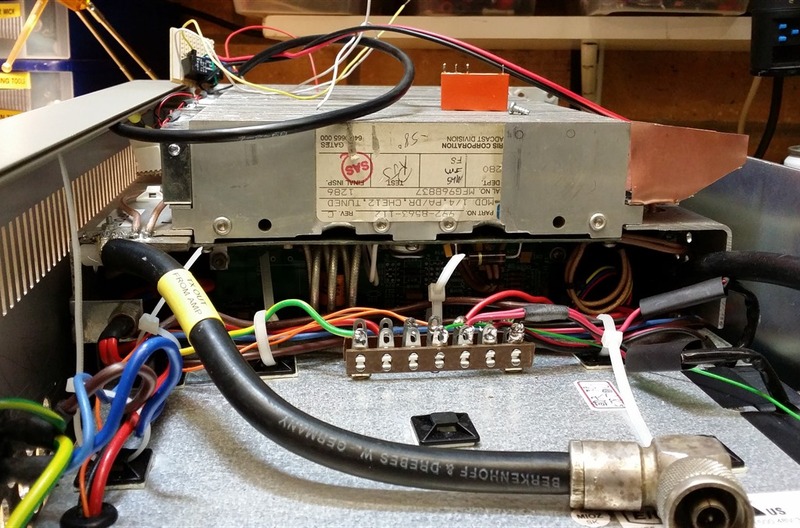 These parts were added to control a rise in idle current as the transistor heated up on long transmissions.”, this is a mod for me to do at some point in the future. 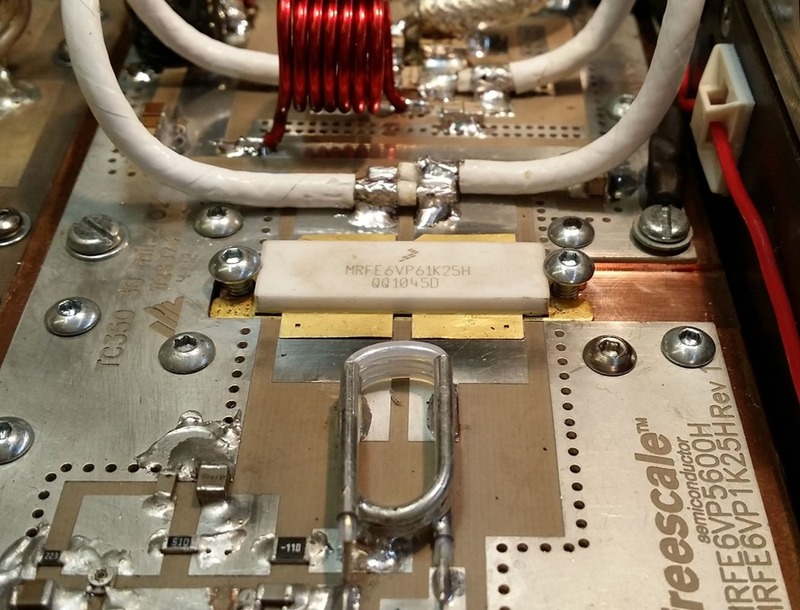 The critical part of any high power amplifier is dissipating heat, i.e. the heat sink. I keep bringing up the whole MTTF thing but it is so critical to any amplifier design, I would go so far as to say it is the foundation of any good design. 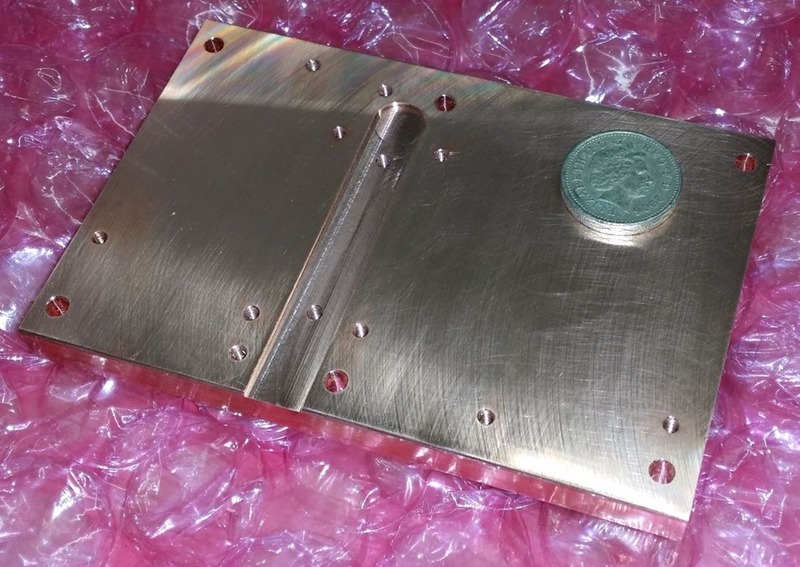 So with that in mind a recommended method to dissipate heat as effectively as possible, is to mount the PA device onto an intermediary copper plate which is then mounted onto the heat sink proper. 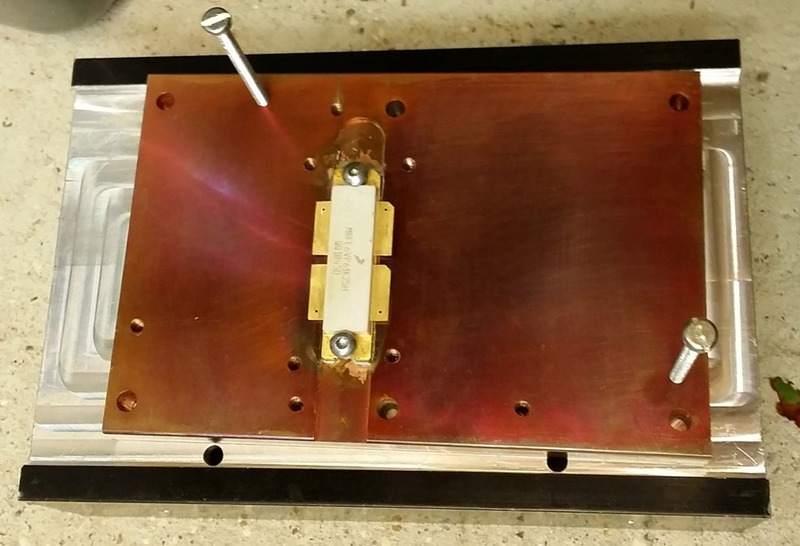 The copper plate allows the heat from the PA device to spread out further than just the footprint of the PA device and dissipate into the main heat sink over a greater area. 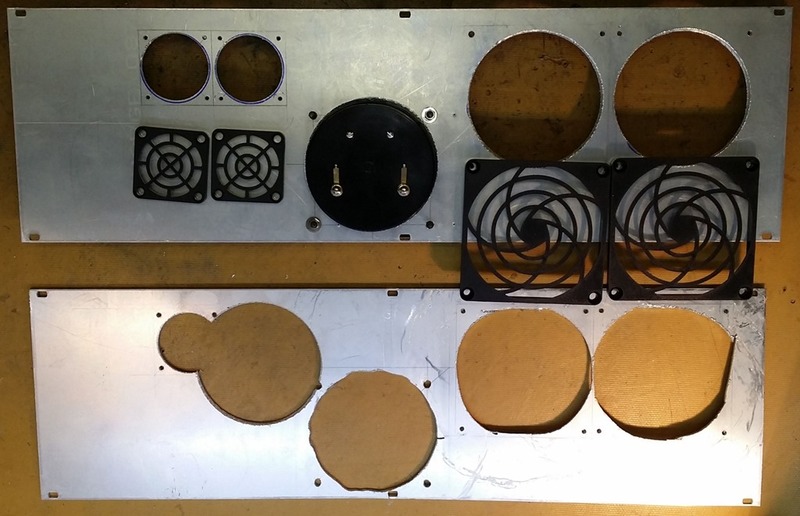 In terms of an SSPA amplifier, Bert PE1RKI produces a 10mm thick, surface ground, milled copper plate which comes drilled and threaded ready to accept the PCB board and in turn be mounted onto a larger heat sink. Why do I mention surface ground? 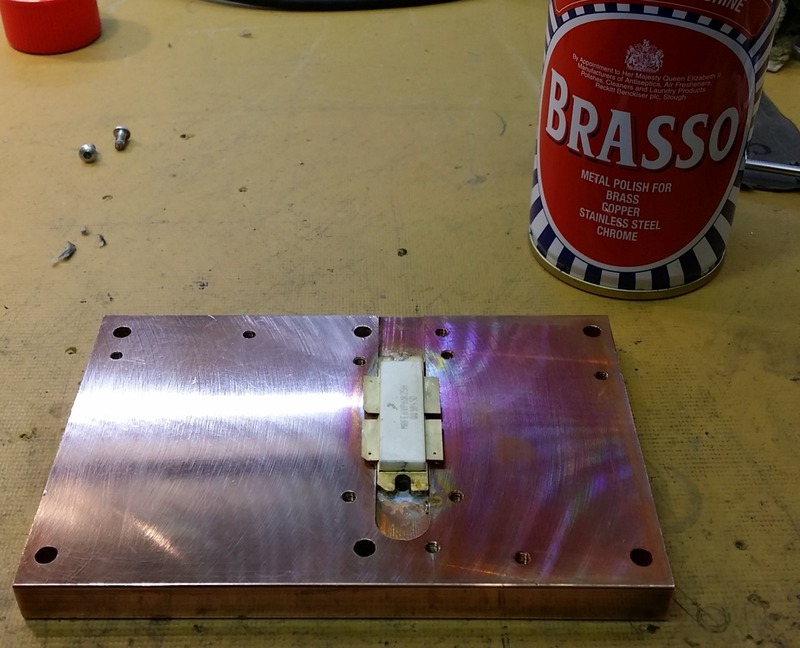 Well it means Bert grinds the copper plate perfectly flat to ensure the interface between the copper plate and heat sink is as efficient as possible with no gaps or ridges between them, again ensuring the best possible heat transfer and increase in the MTTF. Of course you’ve probably read this has just said “how on earth do I solder something to a lump of copper this big?”. Well you use a griddle pan and a gas hob of course! As you can see I decided to solder mine. The proper method is to use a temperature controlled hotplate but as I didn’t have one I used the griddle and an IR thermometer. I held the PA in place using a couple of M3 screws, the long screws are for handling. 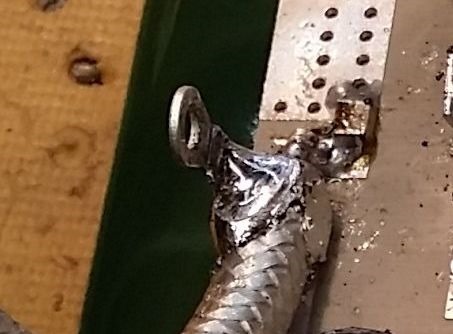 It took around 15 minutes of gently increasing the heat/temperature before the solder melted. once that happened I added a small amount of additional flux and moved the PA device a little with a long thin screwdriver to try and reduce the chance of any voids. 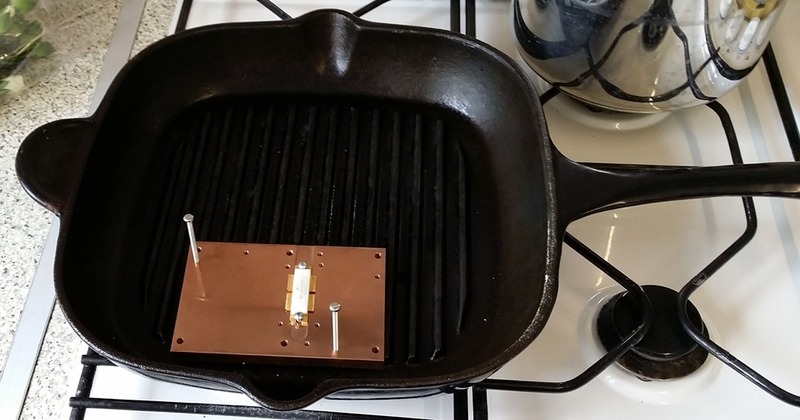 Once the solder had taken I kept the heat on for a further minute then took it off allowing a slow cool time with the copper block, now with the MRFE6VP61K25H attached, was left on the griddle till it was cooler then I transferred it to a proper heat sink to cool further to ambient. Once the plate was cool it was time to clean it as copper always oxidises when heated and this oxidation can cause both an electrical and thermal insulation barrier which we don’t want, so get the Brasso out. Once the copper block has been polished, just slide the PCB back into place and screw it down to the copper block, solder the PA pins to the PCB and that’s the PA section done. There are numerous ways you can connect to the input and output of the PA board. Some constructors use coax, soldering the inner directly to the PCB output and clamping the braid to the heatsink but I decided to fit an N-Type connector on the output so I could easily connect to the out for testing or be able to remove the amp and disconnect the coax, using an N-Type means finding a way to mount it. The thought about using a right angle bracket to hold the N-Type to the side of the PCB/Copper block but I’d prefer the ground of the connector to be as close to the the PCB ground as possible, for this reason I decided to drill the copper block so the N-Type ground was directly connected to the PCB ground. This held the N-Type connector in place and keep a good ground on the output. The next thing I done was soldered a ring connector to the output coax to align with one of the N-Type mounting holes which again kept a good ground to the output but also added mechanical robustness to the coax. One of the reasons I removed the SMA was I decided to install an input attenuator on the input, I wasn’t happy that the low 2.5w drive so I fitted a 6dB attenuator before the input thus increasing the input drive requirement to 10w and, in my mind anyhow, makes the input a little less likely to be overdriven. This input configuration is only temporary, I finished the amp only a few weeks before moving house so I only had time to put in the basics, however I plan to implement a protection circuit designed by ON4KHG on the input. Great describtion. Maybe I replace my tube by SSPA in the future. See you on VHF.